Oh! Oh sweet, sweet relief! I have completed writing Blizzard! Yet, now, this means editing must begin. The second half of my book is in my Beta Reader’s brilliant hands and I’m waiting for word back from my cover designer-God bless her I put in a major change request to my cover she had been working so hard on :S.
I will begin applying edits to the first half starting tonight, should hopefully only take me a few short days to cover what’s been given. The book goes to my editor on February 12th! So exciting! It’s not expected to be published by mid-May. I know that’s some time away now, but it will give an opportunity for refinement and perfection! I’m exhausted, but excited. I have gone over 100K words in Blizzard, and have only two to three chapters remaining before its completion. I’ve been sick, thanks to my gremlin, and struggled to get better. While days late now on my goal for completion, I am feeling more confident in what I have written. I always find that my story evolves the closer I get to the ending, and though these changes were all considerations for how things could/should go, it has built the grounds for greater possibilities at the end and for the final book in the trilogy. A swirling vortex of options, too much fun! Still, I’m ready to end this. I just find some struggle with finding the right words, the proper way to express my thoughts as it continues. It has its own life, and it deserves all the respect I can possibly provide. For now, it’s nearly midnight, and I do have work in the morning. Here I am, working away on completing Blizzard, and I was also able to finalize the blurb you can read on its cover once in print ;)! I have finally made it, I’ve reached coming to the conclusion of Blizzard! I’m so excited, I have reached the part that I have long sought to express and detail. Presently, I’m at just under 98K words, but I must sleep. I had to stop, I have work in the morning that requires I be prepared. That part of my life requires a hefty workload in the wake of recent changes, and I always aim to do whatever I can to assist and support. Today was spent writing, knocking out nearly 10K words-a little over 9K is what I managed, and I cannot feel anymore proud of myself than I do in this moment. Well…aside from when I complete the book and my lovely Beta Reader’s get their ingenious hands on it -^_^-! By tomorrow night, I will say possibly latest being Saturday afternoon, Blizzard will be complete. I’m so excited for all that is to be discovered! Disappointment comes in so many options, so many reasons, and ways. Some, of course, simply cannot be helped. I had such high hopes for this weekend, and I was managing to get to that goal. However, here is that proverbial “but”, I have two kids. My son, who is 12, and my daughter, who is 16 months. My son is easy enough, he’s more than self-sufficient, a wonderful helper, though at times a little bananas (ADHD), but my daughter. HAH! There’s the catch. I love her, she is my little gremlin, I call her Nugget. Like a golden nugget, so beautiful and perfect in her natural state, if not rough around the edges. Yet, how do either impact my work? My son, pretty much never. He enjoys his video games, listening to his music, reading, playing with his Roblox toys and the like. My daughter, well…she has some serious health issues. Tubes in both her ears, needs her adenoids removed-anticipate that to be early this year when we have to replace her tubes (because of the adenoids), and two holes in her heart. She’ll be getting surgery on her heart most likely around her second birthday this year. Her adenoids, however, are a more prominent problem at the moment. She goes to daycare when I go to work for my day job, and as all children, she gets Everything those other babies get. So she has a cold, she has her big girl teeth (molars) coming in, she has a runny nose. She has had more colds in her 16 months of life than I’ve had in the last four years-and considering I am Constantly sick (though my tonsillectomy last month should help cure a Lot of those illnesses) that is not good. The last several nights have been my Nugget waking up in the middle of the night, for Hours. Hours, and hours, and often she’ll go to bed after one bout, and wake up again for another round of being up, sickly, angry, for hours. It’s always about 2-4 hours, so my options for sleep, my ability is taken away. So was my writing opportunity. It’s frustrating, and exhausting. While I will still finish my book this week, my deadline is the 19th, I did not meet my planned goal. That’s what children are about, though. They come first, no matter what’s going on. Oh, I know what to do for my little Nugget. Nasal sprays, rinses, cool mist humidifier, etc. etc. Today, this week, gives me an opportunity. A winter storm has hit Texas, and SE Texas is not accustomed to such severe winter weather as this, we are generally not prepared in the same way you would see northern states. We’re not Oklahoma, or Colorado, prepared with drivers who brave the storm and salt the highways and roadways. So, work from home I shall, while enjoying a joyful cup of hot chocolate! My chitlins are home with me, and I still have work, but I can make this work! As the #AmazonGiveaway ends #TODAY, the #GoodReads #Giveaway begins! 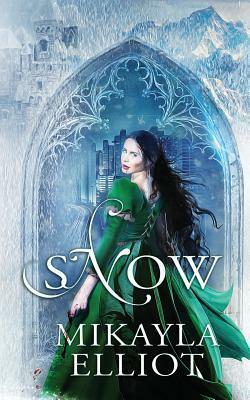 Enter below to win for another chance to win 1 of 6 Paperback copies of #Snow!